January 1, 1973. I was sixteen years old. It was New Year's Day morning and I was hanging my newest poster of Roberto Clemente on my bedroom wall. My older sister came into my room to break the news to me. Roberto had been killed in a plane crash the night before. Roberto Clemente was my childhood baseball hero. He died doing the one thing he did even better than playing the game. Helping others. I was very young the first time I saw Roberto play. My Dad took me to Connie Mack Stadium in Philadelphia in 1966 to see the Phillies Play. They were playing the Pittsburgh Pirates that day. I don't remember much about that game, except that the Pirates had one guy that just seemed different from everybody else. He was also the only black player in the Pirates line-up that day. I remember watching him at home plate. Cocking his front knee. He seemed to swing wildly at the pitch. And when he ran it looked like he was coming apart. Arms and legs flailing as he ran. He caught a routine fly ball in right field, but he didn't catch it like other outfielders. His basket catch stuck in my head. I asked my Dad why he caught the ball like that. My Dad just shrugged his shoulders. On the ride home from Philadelphia I asked Dad who that guy was. "That's Roberto Clemente", he answered. My Dad was my all time hero. Now I had another. From that day on I was a Pirate fan and a Roberto Clemente fan. As I grew up, playing baseball, I patterned my play after Roberto. Cocking my front knee, running like him, hitting the ball to right field as a right handed hitter and even the basket catch, although my coaches had a problem with that. I even bought an 8 millimeter movie of Roberto which I watched on my Dad's old movie projector. Remember this was the 1960's. I must have watched that movie a million times. Forward and reverse, studying every intricate detail of Roberto's swing. Dreaming that someday I could play baseball in the Big Leagues. Once while watching the movie, I stopped the projector to get a stop action look at Roberto. The bulb from the projector burned a hole in the film. Somehow my dad spliced it back together and I was back in business. My parents had a stone driveway. There was a large vacant field next to our house. I had an old broken bat that my Dad had nailed and taped and I would stand in the driveway and hit stones into the field. As time went on, I spent so much time hitting stones that they were starting to dwindle. I didn't know how my Dad would react to that. But one day I came home from school to a big surprise. Dad had ordered a dump truck full of stones. I had another gazillion stones to hit! In 1974, while playing American Legion baseball, I broke my favorite Roberto Clemente model Louisville Slugger. My Dad again, nailed it and taped it. He drilled large holes in the barrel and somehow filled the holes with lead which made the bat very heavy. I would stand in front of the basement wall with a light behind me so I could see my shadow and swing my heavy bat hour after hour. Cocking my knee and blasting imaginary line drives over the right field fence. I became such a good hitter that Major League scouts began to show up at my high school and then American Legion games. I finished my final season with a .500 batting average. 75 points higher than the second place hitter. I also led the league in hits, home runs, runs batted in, total bases and assists from the outfield. I recall one game against the best team in the league. They had better than average pitchers. We lost a close game but while the scouts, and of course my Dad, looked on, I managed to hit a single, a double and a triple and threw a base runner out at third and one at home plate from, naturally, right field. A week later I was sitting in math class during my senior year in high school. Our baseball coach, George Williams, knocked on the classroom door and asked the teacher if he could interrupt class for a moment. Right there in front of all of my class mates, Coach Williams presented me with a certified letter he had received. It was addressed to me and had the Pirates logo on it. It was an invitation to a Pirates try out camp. The Pirates! I always appreciated the Coach handing it to me with my friends around. I went to the try out camp. My throws from the outfield were good and during the game I hit a single and a double off the right field fence. They had us run the 60 yard dash and timed us. I narrowly beat my good friend Winde Lawrence to have the fastest time in camp. But I was still in high school and the rules then were that a Major League team could not sign a player before he finished high school. One night later that summer, Elmer Valo, who was a scout for the Phillies came to our house with a contract for me. Dad was so freaking proud and also was a nervous wreck while we sat at the kitchen table with Valo and my Mom trying to talk him into giving me more money. I batted .368 during my first season in minor league baseball with the Phillies. During spring training in 1975, a knee injury pretty much ended the dream. I finished that season but couldn't run very fast anymore, even though I managed to hit two triples in my final game. Both to right field. But the hand writing was on the wall. But back to 1966. Later, after that 1966 Major League season, Roberto Clemente was named the National League's Most Valuable Player. He played eighteen seasons with the Pirates. Back then, there was no free agency. Our favorite player played his entire career with our favorite team. Unless, they traded him. And the Pirates sure were not going to trade Roberto. The "Great One" as they called him in Pittsburgh, began his career with the Dodgers who were still in Brooklyn. The Dodgers ran a try out camp in Puerto Rico where Roberto lived. After signing Roberto, the Dodgers assigned him to their triple A team in Monteal, Canada. Back then, the rule was that if a Major League club signed a player for more than $4,000, they had to keep that player on the Major League roster for at least one year. If they didn't, any other club could draft that player. The Dodgers had signed Roberto for $10,000. They knew that they risked losing him, but they kept him in Montreal anyway. Why would they do that? From what I've been able to learn through books and research, the Dodgers already has Sandy Amoros, Jackie Robinson and Roy Campanella in their starting line-up. This was 1954. Not far removed from Jackie Robinson breaking baseball's color barrier. If the Brooklyn Dodgers added Clemente it would be the first time that there would be more blacks than whites on the field. Dodger ownership wasn't sure how white fans would take to that. The New York Giants had also been interested in Clemente. The rumor was that the Dodgers signed Roberto, to keep him away from the Giants. The thought of Clemente and Wille Mays in the same outfield was too much for the Dodgers. Soon, Major League scouts were coming to Montreal games to see Roberto Clemente play. In an effort to hide Roberto from the scouts, Monteal manager Max Macon benched Roberto. But it didn't matter. Pirates' scout Howie Haak liked what little he saw of Roberto. Branch Rickey, who was the Pirates' general manager at the time, said,"he's better than anyone we have in Pittsburgh right now. We are going to finish last and we are going to draft him". Rickey kept his word. On November 22, 1954, the Pirates drafted Roberto Clemente away from the Dodgers for a mere four thousand dollars. It was possibly the greatest "steal" in baseball history. Roberto hit .255 during his 1955 rookie season. He batted .311 his second season and went on to hit over .300 thirteen times. In fact he had the highest batting average during the decade of the 1960's. Higher than both Willie Mays and Hank Aaron. And his defense and spectacular throwing arm became almost legendary. 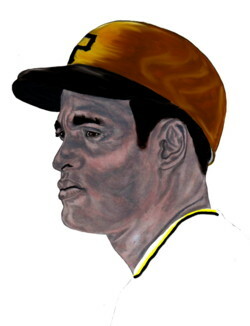 He helped the Pirates win the World Championship in 1960, hitting .314 and driving in 94 runs. Roberto hit safely in all seven World Series games in 1960. But it was his performance during the 1971 World Series that got Roberto national recognition. During that 1971 World Series he again hit safely in all seven games, finishing the series with a .414 average. And he did it against a Baltimore Oriloles team that featured four 20 game winners. Roberto hit two home runs and a triple and led the Bucs to the championship, winning the series MVP award. One writer called Clemente's performance a "Tour De Force". During the 1972 season, Roberto was closing in on 3,000 hits. Injuries slowed him for most of the season. He played in only 102 games in 1972. On the next to last day, he had 2,999 hits. The Pirates were playing the New York Mets. The night before, Roberto almost got number 3,000 against Tom Seaver. I was listening to game on KDKA, Pirates radio station. He hit a chopper to Seaver's left that glanced of Seaver's glove. Second baseman Ken Boswell fielded the grounder but didn't make a throw. The umpires immediately stopped the game and got the ball and gave it to Roberto. They assumed it was hit number 3,000. But the official scorer did not agree. He ruled it an error on Boswell. I remember how upset I was that they ruled it an error. His last time at bat, Clemente hit a line drive down the right field line but Rusty Staub made a great catch. Now it would be Jon Matlack on the mound for the Mets for the last game of the 1972 season. In his second at bat of the game, Clemente lined a one hop double off the left field fence for hit number 3,000. That hit would be his last regular season hit. The Pirates went on to lose the National League Championship Series to the Cincinnati Reds. In an interview near the end of the season, Roberto said that he didn't know if he would be back next year. On December 23, 1972, a massive earthquake hit the city of Managua, Nicaragua. Roberto was in charge of the relief effort in Puerto Rico. After hearing rumors that the supplies were being sold to the people, Clemente decided to go there himself. He boarded the DC-7 that was grossly over loaded. The flight was postponed several times because of engine problems. But Roberto was determined to go. The plane took off and crashed into the ocean seconds later. My beloved Roberto was gone. Several days later, part of the plane and the pilot's body were found, but Clemente's body was never found. On March 20, 1973, The Baseball Writer's Association Of America held a special election and waived the five year waiting period for eligibility into the Hall of Fame. Roberto was only the second player ever to have the waiting period waived. Lou Gehrig was the other. Roberto Clemente, my hero, ended his career with 3,000 hits and a .317 lifetime batting average. 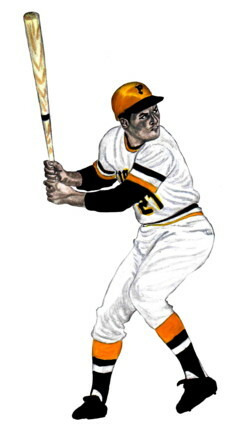 He won four National League Batting Titles and the MVP Award in 1966. He collected twelve Gold Gloves and the World Series MVP in 1971. He played in eighteen All Star Games. At the time of his death, Roberto had played in more games, went to bat more often, drove in more runs and hit for more total bases than any other Pirate. I lost my other hero, too. 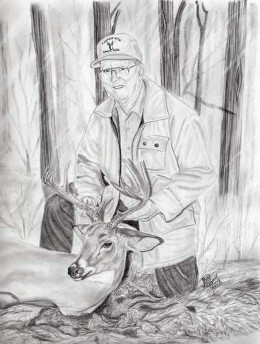 My Dad passed away in 2008. I still play baseball in the Men's Senior Baseball League and still wear number 21. And I still practice my Clemente swing with the Louisville Slugger my Dad fixed up for me in 1974. And I'll always be grateful that he took me to Connie Mack Stadium that day so long ago.